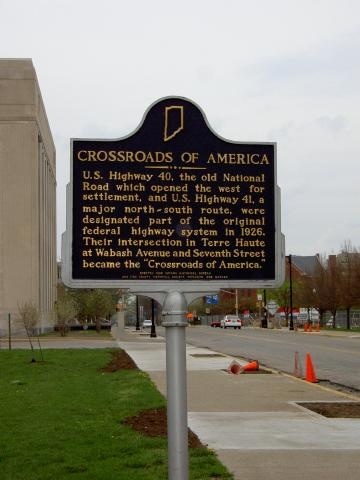 The Crossroads of America is a nickname and motto given to the state of Indiana as it, and, more specifically, the city of Indianapolis is the hub for several major Interstate highways that criss-cross the state, connecting Hoosiers to the rest of the United States.
" . . . in my column, Paragraphy, I started a campaign for suggestions for a motto for Indiana. In a period of two or three weeks, I received three hundred and twenty-four suggestions. These were printed in folder form, without the names and addresses of the senders, and forwarded to the State legislature then in session at Indianapolis. A committee of three from the House and two from the Senate took this list of mottoes and selected 'The Crossroads of America.'" "Section 1. Be it resolved by the House of Representatives of the General Assembly of the State of Indiana, the Senate concurring, that the expression 'The Crossroads of America' is hereby designated and adopted as the official State motto or slogan for the State of Indiana." Joint Resolution No. 6, adopting The Crossroads of America as the official motto of Indiana, was adopted by the Eightieth Session of the General Assembly on March 2, 1937. Note that The Crossroads of America was adopted as the official state motto or slogan. We can't help but wonder when it's used as a motto and when it's used as a slogan. The year was 1937 and the motto certainly suggests that the intersecting of important roads, railroads and waterways of the nation occurs within the boundaries of the State of Indiana. Indeed, Indiana was on the path west by many settlers coming from the northeast and east central states. The first major road to cross the state was the historic Cumberland, or National, Road, now labeled US Route 40. This road was built in the early 1800s. Many railroads provide freight service in Indiana and the Lake Michigan ports of Burns Harbor, Buffington, Gary and Indiana Harbor provide connections, via the Great Lakes and St. Lawrence Seaway for oceangoing ships from around the world. Smaller ports, Southwind and Clark, are found on the Ohio River, providing access to the Mississippi River and the Gulf of Mexico to the south. "'The Crossroads of America' signifies the importance of waterways, railroads, highways and other transportation facilities in the state, viewed by many as some of the finest in the nation." The adoption of the official state motto of Indiana was by House Joint Resolution and is not documented in the Indiana Code. Interstate 275, the Cincinnati beltway, is interesting in that it serves Indiana only briefly, with a single interchange in the state at U.S. Highway 50. In the early days of cross-country travel (by horse and wagon), Terre Haute, Indiana benefitted by its location on the old National Road between Indianapolis and Vandalia, Illinois. The National Road was later named U.S. Highway 40 when it was made a U.S. highway in 1926. At about the same time, U.S. Highway 41 was commissioned between Chicago, Illinois and Miami, Florida. This north-south highway through downtown Terre Haute followed Seventh Street at the time, and met U.S. 40, which followed Wabash Avenue, the main east-west street in town. The Seventh and Wabash intersection thus became known as the "Crossroads of Dever," an appellation now memorialized with a historical marker at that corner. NW corner of Seventh Street & Wabash Avenue, Terre Haute. Erected 1998 Indiana Historical Bureau and Vigo County Historical Society, replacing 1988 marker. Vandalia, Ohio has also been called, at one time, the Crossroads of America due to U.S. Highway 40 and the eastern division of the Dixie Highway crossing in the middle of the town. I-75 and I-70 cross in Vandalia as well.